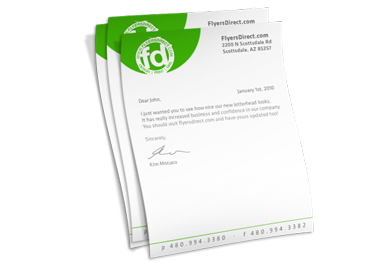 Letterhead is an important part of your identity and a staple in your office. It is a tool for communicating with clients, presenting ideas, invoicing, providing company information, and much more. Well-designed letterhead should cleanly and professionally present your company name, logo and contact information, while leaving ample open space for writing. Standard 8.5 x 11″ letterhead is often ordered and printed in conjunction with envelopes, but can be ordered separately.